The intrauterine device (IUD) is the world's most widely used method of reversible birth control for women. But as their production and common materials cost only a few cents, they are sold for a staggering 400$- 850$. Unreachable for many women, especially young ones. The Bearina IUD is a political product. It demonstrates the disruptive potential of 3D printed Open Designs to give free and global access to essential products, and circumvent industries (such as the Pharma industry) that aggressively defend their intellectual property to control the price and availability of their products. As an Open Design, the Bearina IUD promotes collaborative development and free sharing of knowledge. Further developed by a networked community or in partnership with a forward looking pharma company, It is always available for experimenting with and improving, and could evolve into a functional IUD. The Bearina, with its bear head image, is visually friendly, to appeal, so to speak, to younger women. It is a conceptual product, a design fiction, and absolutely should not be used as an IUD. Nevertheless, it is designed according to dimensions, materials and shapes commonly found in IUDs. You are welcome to download the production file of the Bearina IUD (.stl- Creative commons nc-at-sa 3.0 lisence) from my website (www.ronen-kadushin.com). It is free and ready for 3D printing. But if you prefer, you can also download it, or even order some Bearinas from Shapeways.com. They are only 1.25€ each. In copper- containing IUDs, metal ions dissolving from the device create a spermicidal action. To do precisely that, a 1€ cent coin (copper covered steel) easily snaps in the plastic 3D printed part. 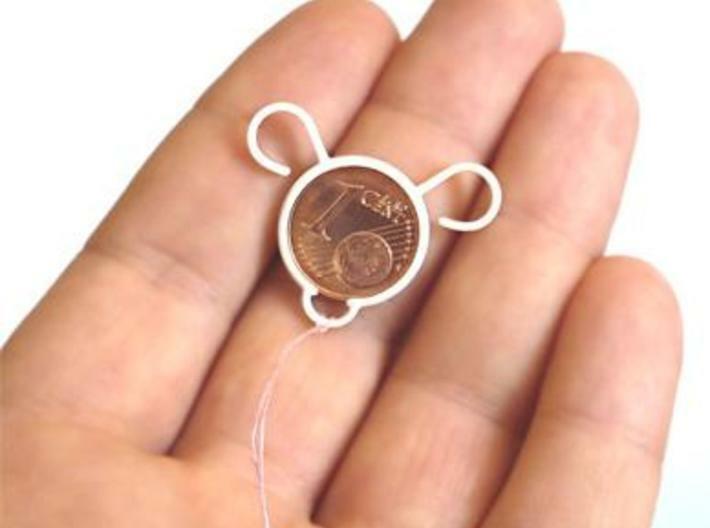 An additional piece of nylon string is tied to the bottom part to complete the assembly of the Bearina IUD. The Bearina is a conceptual research object, and absolutely should not be used as an IUD or for any internal use. You expressly agree to hold the designer, Ronen Kadushin, harmless for any property damage, personal injury and/or death, or any other loss or damage that may result from your use of the information or designs provided, specifically the Bearina IUD concept design. The use of Open Design designs should be based on your own due diligence and you agree that Ronen Kadushin is not liable for any success or failure of your actions you take to modify, produce, assemble or repair your products. The user further agrees that use of this design and all products or content contained herein are at your own risk and there is no warranty expressly made herein.